What a stunning piece. 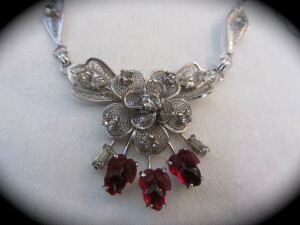 This vintage necklace is sterling silver and embellished with red glass stones and clear prong set rhinestones all among some fabulous filigree work. There is so much detail to this, even the chain is individually linked. 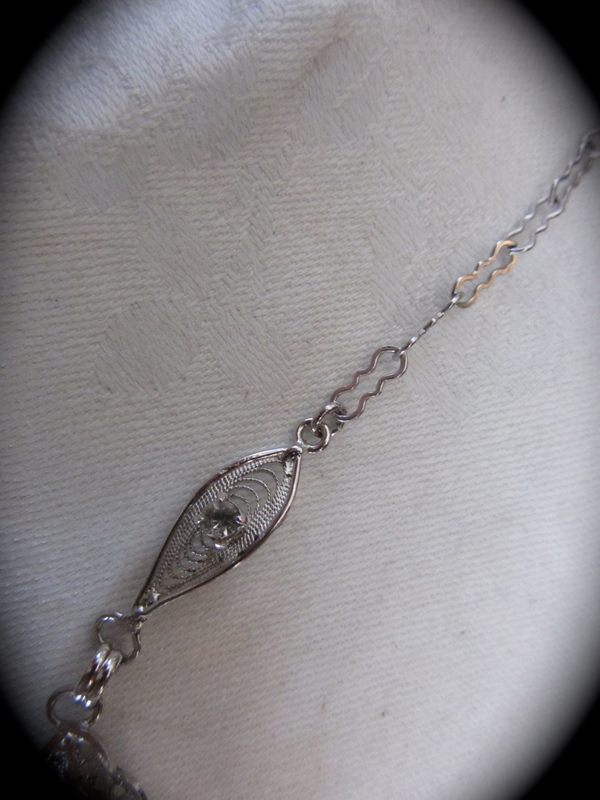 This necklace measures 19″ in length. 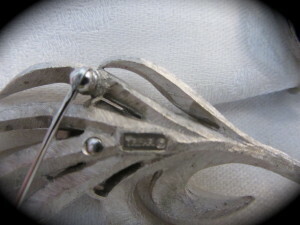 The pendent measures about 2″ wide and a drop of 1 3/4″. 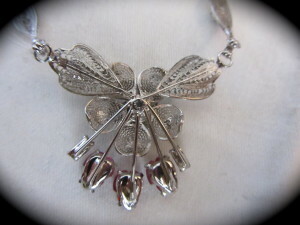 The center has s silver filigree flower that has prong set rhinestones scattered about. The bottom of that has three red glass molded fruit. I am not sure if they are apples or some kind of berry. The light shines through them and they are a soft red, very pretty. 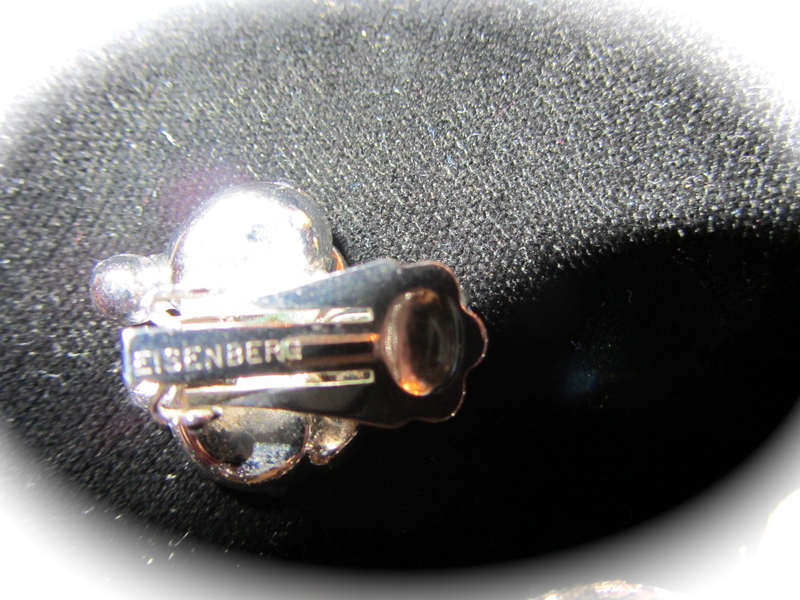 The back of the “pendant ” is marked: ‘STERLING” and so is the chain. 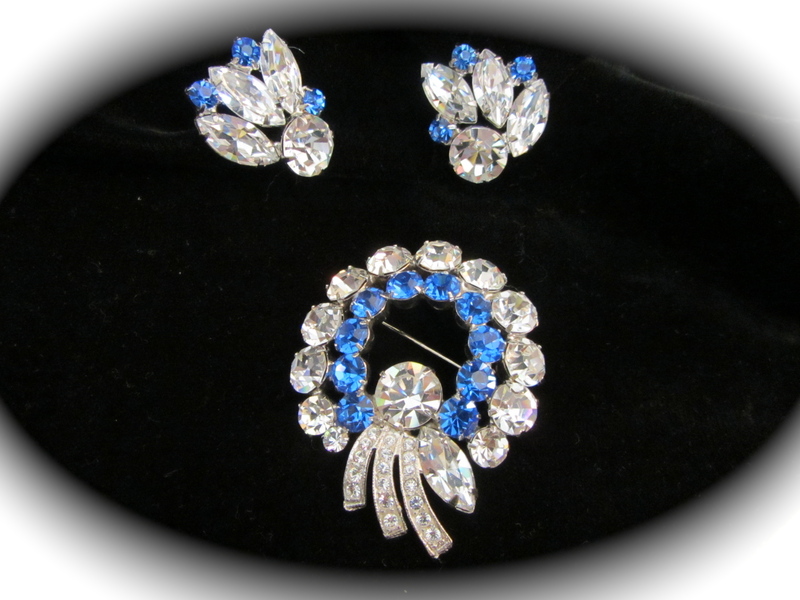 Gorgeous Weiss Brooch and earring set. 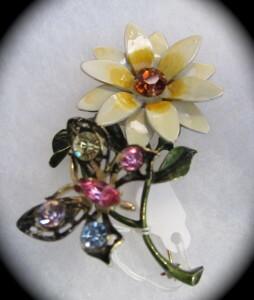 This vintage set is signed on the back of brooch. 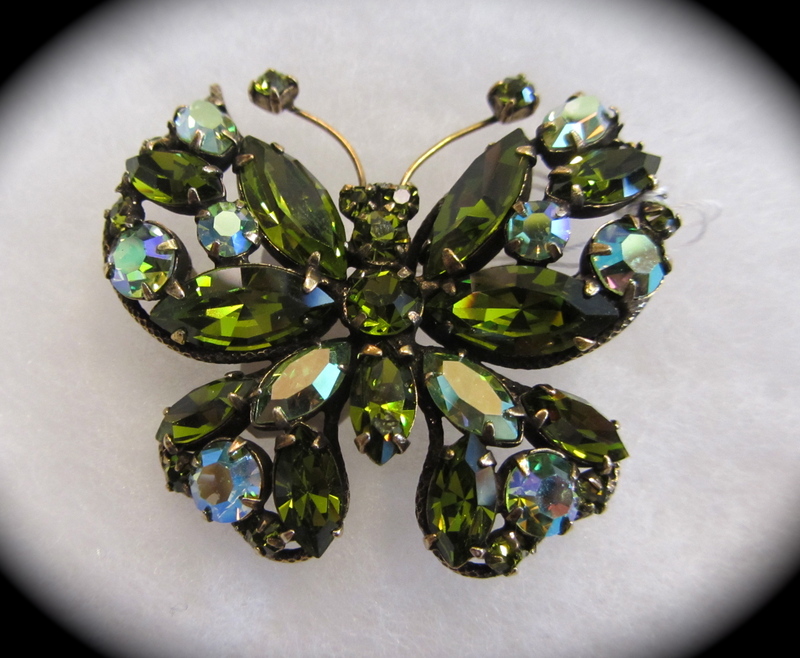 Excellent condition with so many faceted stones it was hard to photograph! The shine is truly blinding. 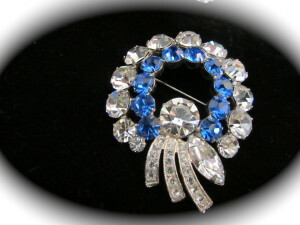 The brooch is a wreath shape or circle pin. It measures 2 1/4″ long. The back is rhodium. 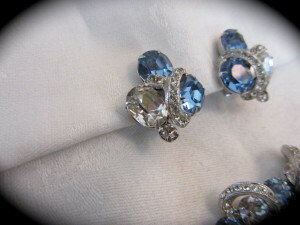 The earrings are clip style and measures a little over 1″. Amazing shine and sparkle to this set! 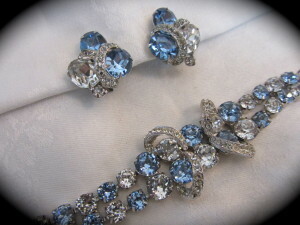 Baby Blue Eisenberg Bracelet and Earrings..~Stunning! Beautiful Baby Blue Eisenberg Bracelet and Earrings! The bracelet measures 7″ long. 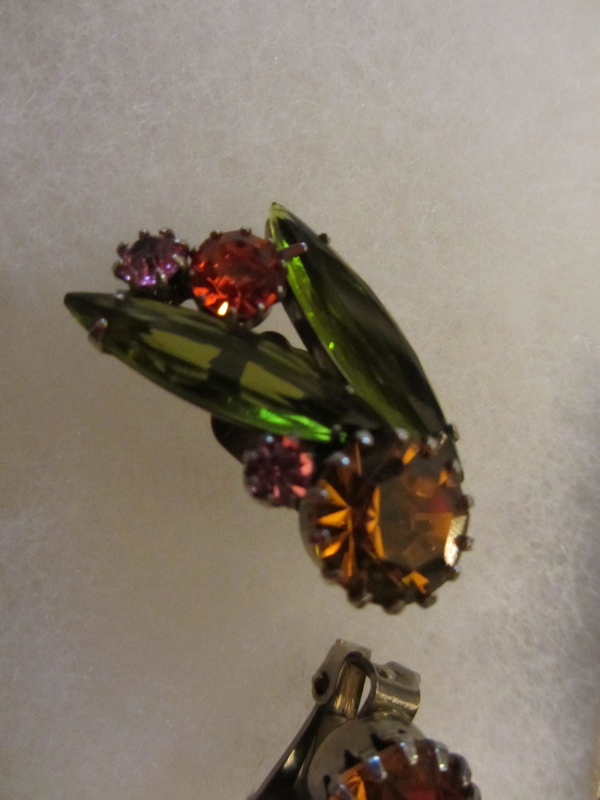 The rhinestones are prong set and graduate to larger stones in the center of the piece. 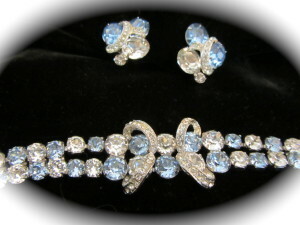 There is four raised silver “bands” that have a row of rhinestone on them. 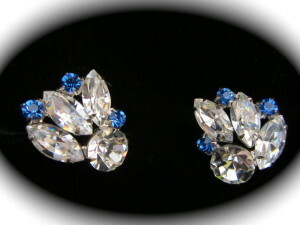 The earrings are a clip style and have 3 large faceted stones, 2 blue and one clear. Then there is a “band” around one blue stones with pave set style rhinestones. The bracelet and earrings are both marked: “Eisenberg”. All pieces have a rhodium back and are very clean. Simply stunning set. Dress up a pair of jeans and a great blouse with this set! 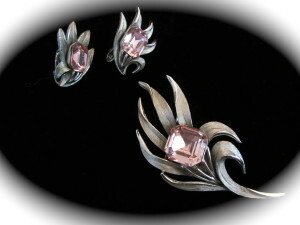 Super sweet silver and pink vintage brooch and earring set by Trifari. This is a really sharp set. There is a mixture of textured silver finish and the edges of the leaves are a high polished shiny silver. Really gives this set a classic look. The brooch is 3″ long and has a square 1/2″ pink faceted rhinestone. Very pretty pale pink color that just pops! The back is marked: “Trifari”. The earrings are clip style and measure a little over 1″. The pink stone is very vibrant and shines brilliantly! 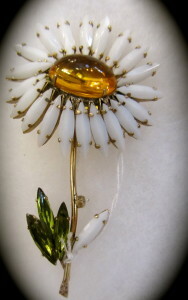 Henry Schreiner designed this Daisy Brooch and it is marked on the back: “Schreiner New York”. The rhinestones are all prong set and in great condition. 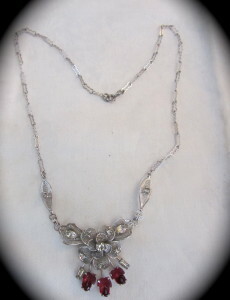 The flower petals are white glass navettes and are set at an angle that really brings this piece to life. In the center is a large amber colored cabochon stone. This pin measures a little over 3″ long. Schreiner started designing pieces for Christian Dior before opening his own business in the 1950’s. Weiss Flower Brooch and Earring set. All prong set stones with an amazing shine! 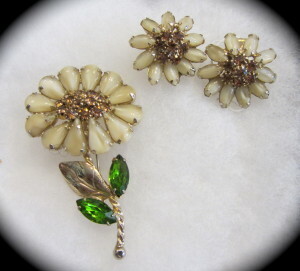 The petals on the flowers are glass beads and the inside is prong set rhinestones. These are all set in a gold tone metal. 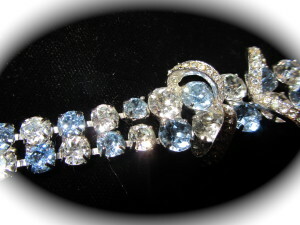 The brooch measures 3″ long and is marked on the back: “Weiss”. The two leaves on the stem are green navettes that are also prong set. 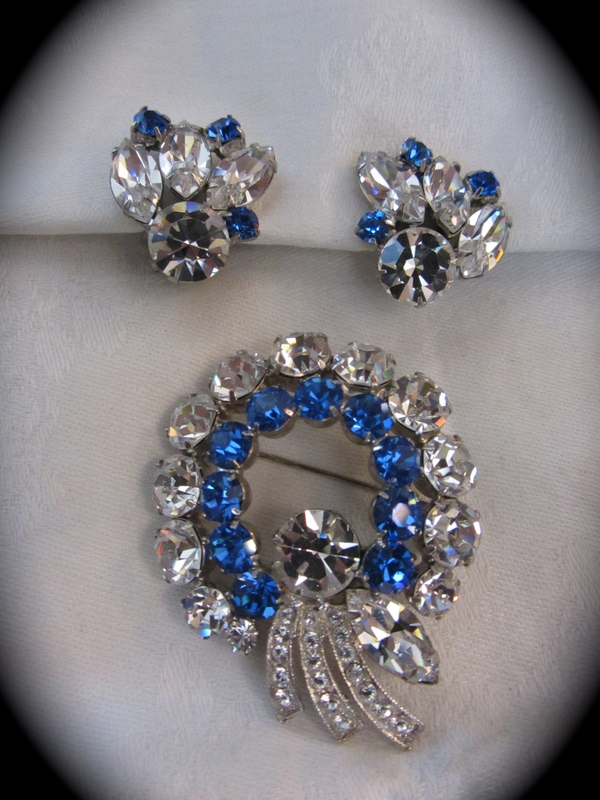 The clip style earrings follow suit with the pin and match perfectly, also signed on back. 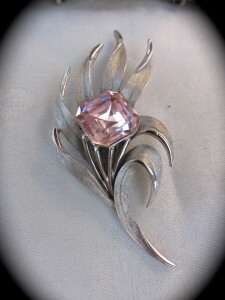 Love, Love, Love, this brooch! There is a yellow enamel flower with a faceted amber rhinestone in the center. 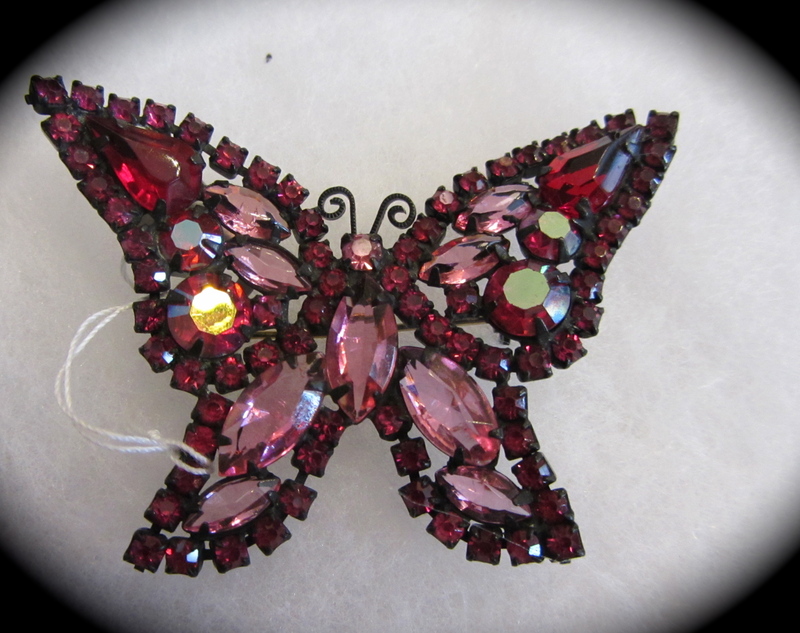 Then the butterfly is on a trembler and has pink yellow, and blue stones on his wings. This pin measures about 3″ long. The back is marked: “Weiss” . This dates to the 1950-60’s. There is minor wear from age, but still lovely when wearing! Gorgeous green butterfly brooch made by Regency c1960. All the stones are prong set and have many facets. About half of them have an aura borealis finish that really pops the colors! Marked on the back: “Regency Jewels”. This pin measures approx. 1 3/4″ in diameter. 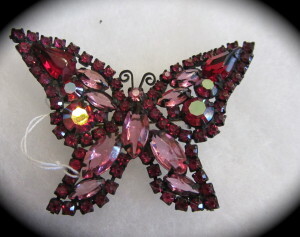 Pretty pink and red butterfly brooch signed by Weiss. 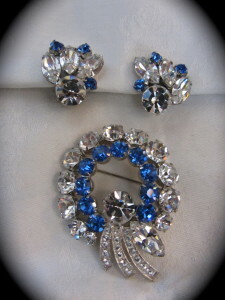 The rhinestone are all prong set and the back is japanned. There is an aura borealis finish on a few stones and they just pick up the colors beautifully! 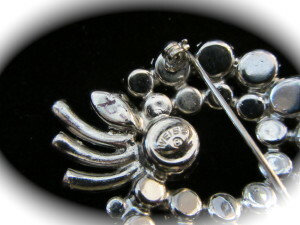 This pin measures 2 3/4″ wide at the farthest point and 2″ long. Marked on back: “Weiss”. 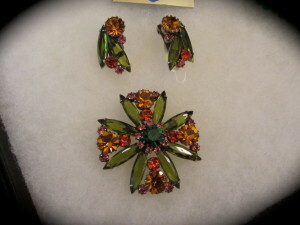 Vintage Brooch and Matching Earrings with the most amazing and brilliant colors. These pieces are all set in rhodium and are prong set, the larger stones have multi prong. 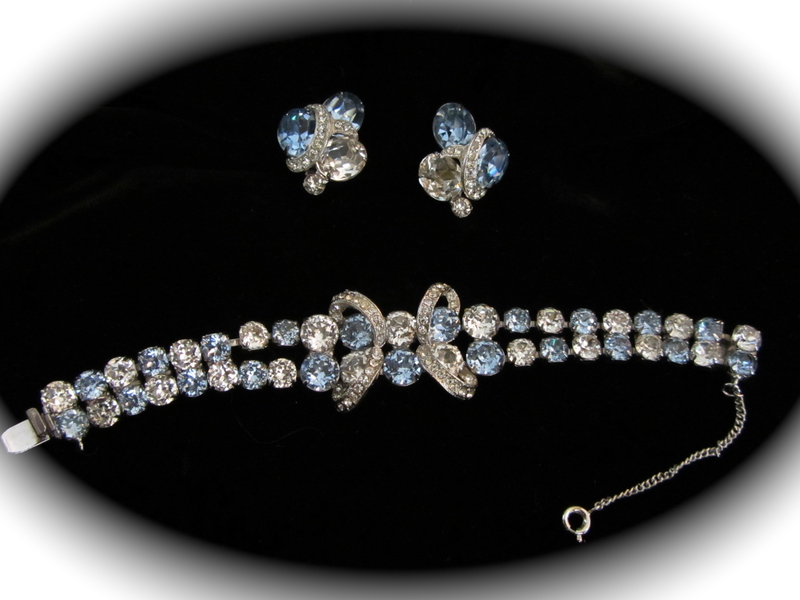 The round stones are all faceted and have lots of sparkle. The brooch is in the shape of a flower and measures a little over 2″ in diameter. 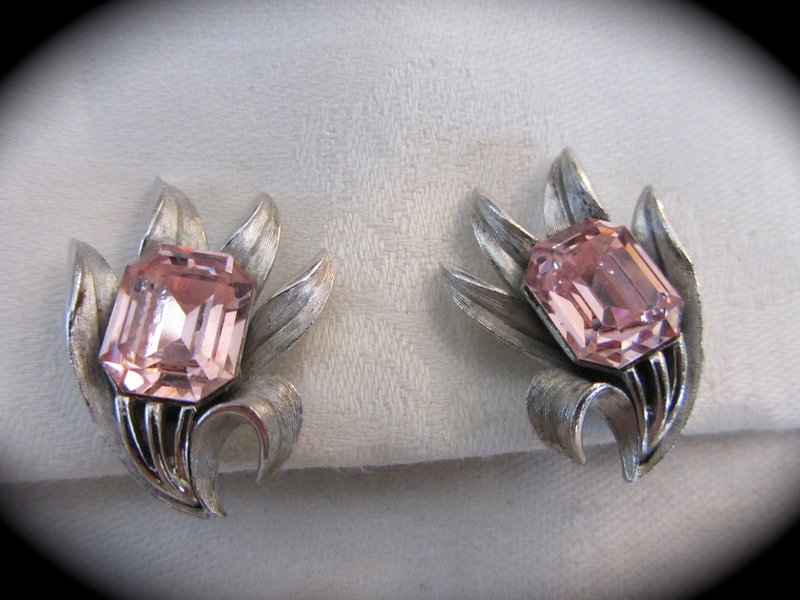 The earrings are clips and are almost 1 1/2″. Olive green, Orange, Pink, Amber, and kelly green are the colors. With this combination of colors it reminds me of c1960’s.